The cocktails are available until the end of the month. With three different cocktails, each using different spirits and flowers, there’s something for everyone in this collaboration. We started with the dangerously drinkable Viola mule. A spectacular shade of purple, this drink infuses vodka with blue pea flowers. Easy on the eyes and the tastebuds, this is a drink to suit any palette. For those who like a bit more of a kick to their cocktails, I would definitely recommend the Dianthus. Don’t be fooled by its bright pink, rose strewn appearance, because this dark rum based drink packs a punch. The rosebud tea adds a hint of floral flavour, without overpowering the alcohol. Finally, my personal favourite was the Gem Marigold, a gin concoction topped with pineapple foam. All of these drinks are special, but this one was the most unusual. The texture of the foam and the citrusy taste result in a cocktail that is perfectly suited to summer afternoons. If you’re feeling peckish while you drink, have no fear because the Polo bar also offers a range of indulgent canapés, as well as more substantial food. The tempura crab makes a particularly good accompaniment to the Gem Marigold, with the citrus flavour cutting through the batter. The breaded prawns are also delicious, with a chilli dip that will make you finish your cocktail a little faster. The portions are generous, so be prepared to share. It goes without saying that the accompanying bouquets are also beautiful. Moyses Stevens are synonymous with flowers of exceptional quality, and their eye for arrangement is like no other. Established in 1876, the company holds a Royal Warrant from His Royal Highness The Prince of Wales. 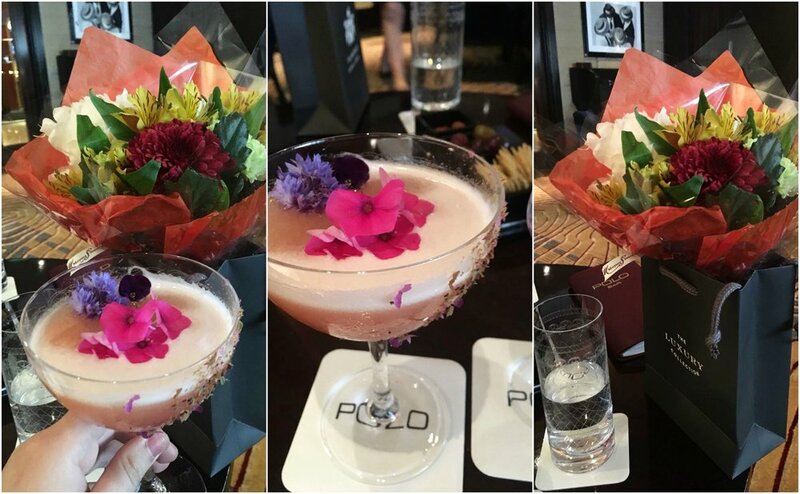 Adding the flowers to the cocktail experience gives an added element of luxury, as well as a stunning reminder for days afterwards.